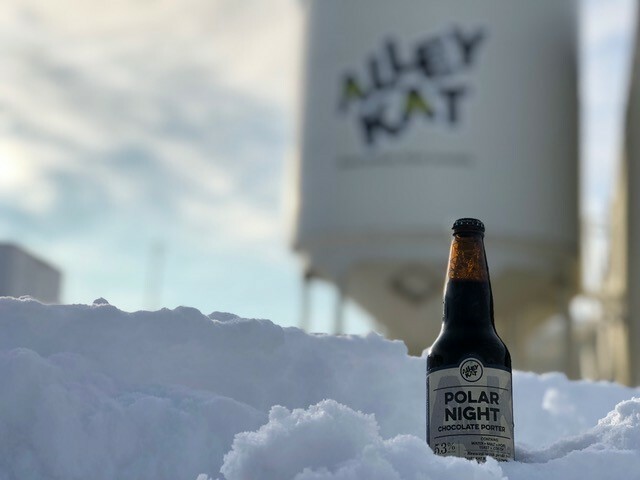 Alley Kat Brewery is Edmonton’s oldest microbrewery. In fact, it’s the fourth oldest brewery in all of Alberta. And it’s entirely possible that kind of longevity breeds a certain confidence to go your own way. Alley Kat’s refusal to switch over from bottles to cans reflects that type of confidence. In an industry chasing the cheaper option, they’re holding firm to what they know is right. Indeed, aluminum is made from bauxite, which must be mined, and glass is made from the more accessible silica. That means aluminum requires twice as much energy as glass to produce. 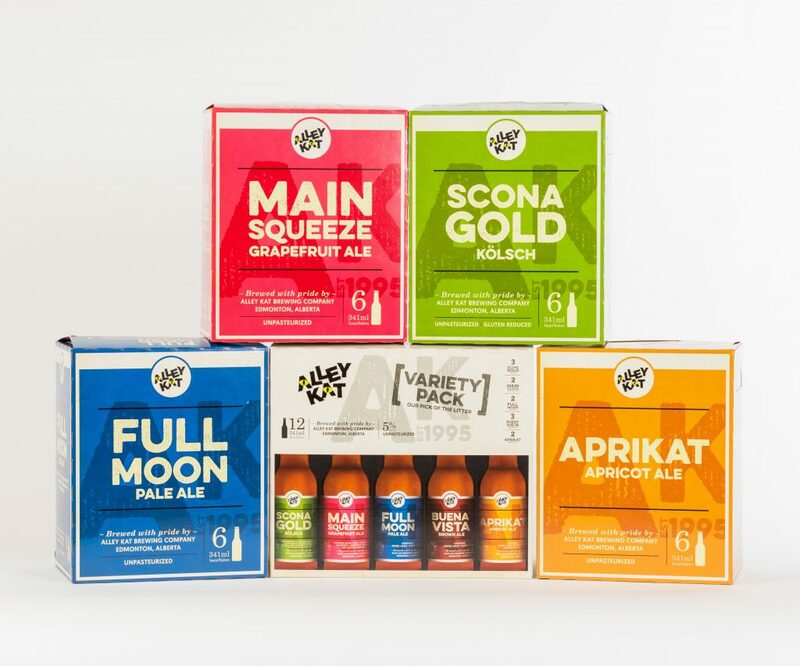 Furthermore, Alley Kat bottles are made from recycled glass, so it’s clear to see their packaging has the smallest energy footprint possible. But Alley Kat doesn’t stop at just choosing the less energy-intensive option. They express their green values at every opportunity. For example, they participate in a brewers’ bottle pool so that their bottles are reused up to 20 times before they are crushed and made into other products. They send their spent grains and grapefruits to local farms, where they feed pigs and cattle. They reuse and recycle water, plastics, and cardboard at every turn. And when they recently renovated their space they used as many repurposed materials as they could. Those repurposed materials included Great Little Box Company (GLBC) pallets that they converted into tables and shelving units. It’s symbolic of the relationship between Alley Kat and GLBC, a partnership built on making green choices possible. 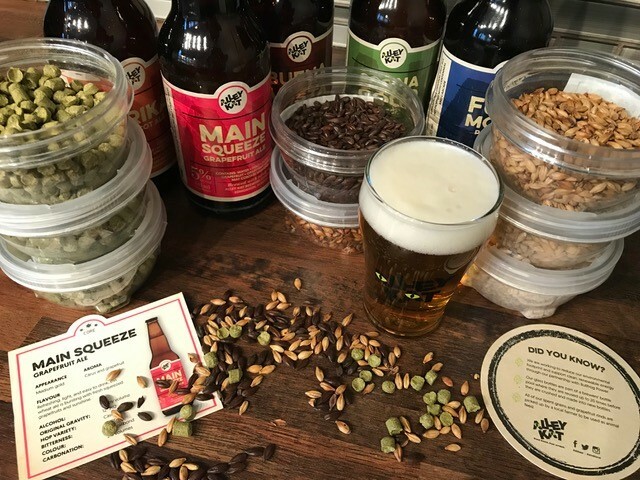 While Alley Kat chooses to go against the flow in a highly competitive and increasingly over-saturated microbrewery market, they have reason to remain confident. Since Neil Herbst founded the brewery in 1995, they’ve remained true to their identity as a hub for true beer fanatics. A business that originally began as a home brewing outfit, Alley Kat is now a respected leader in their industry. At the Alberta Small Brewing Awards, they took home 5 awards, including runner up for Brewery of the Year. Currently, the Alley Kat team is feeling the excitement of preparing to unveil their latest core offering, a hazy New England-style IPA. Cropley explains that this IPA will be different from anything else on the market. It has been extensively researched and test-batched. Its recipe includes the finest hops in the world. It’s all part of a mission to pursue quality over trends, lasting value over a quick buck. From their beer recipes to their packaging choices, Alley Kat is clear on where they stand. Even as cities like Edmonton continue to spawn microbreweries at a rapid clip, Alley Kat retains a strong identity. As Alley Kat continues to define the local Edmonton craft experience as a sustainable one, GLBC remains their committed partner. After all, making green choices possible—and profitable—is just as important to GLBC as glass bottles are to Alley Kat. Ultimately, sustainability is something we can all raise a toast to.